Winter finally got to me. I usually maintain a fairly even keel about the season, and actually rather like the snow when it’s being picturesque (and when I can watch it from my window). This past week, though, the weather took an abrupt shift. We’d been getting a good deal of snow and cold, and then suddenly it was warm. Warm! So exciting. But when the thermometer edges just barely over 32 degrees, snow transforms into its greyer, surlier cousin: slush. After trapping around a landscape that was somehow simultaneously a solid sheet of ice and also a massive, treacherous salty puddle, I flopped through my front door, hungry and crabby — bad cooking conditions. Thank goodness for this recipe. 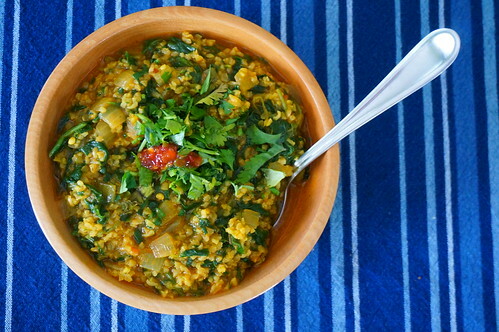 I wish I remembered how I first came across the source recipe, “Spicy Greens with Bulgur (Tchicha bel khoubiz),” because whoever linked me there was obviously an angel. Warda Bouguettaya’s simple recounting of her mother’s recipe has saved my sanity more times than I can count: even in the worst of moods, I can root around in the pantry for some bulgur and in the fridge for whatever green thing I have lying around, and twenty minutes later I have a fortifying meal thanks to the bulgur’s quick-cooking magic. And since it’s so hands-off, I even have time for a nice cup of tea while the dish simmers! I’ve made some modifications over the years. The biggest change is the amount and kind of bulgur. 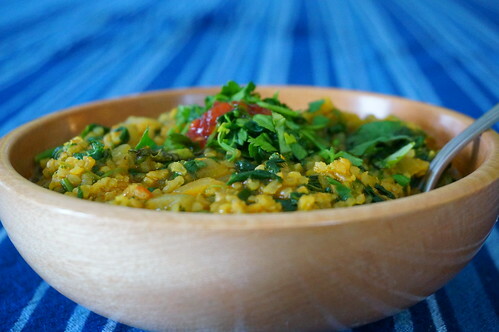 I use medium bulgur instead of the fine bulgur Warda dictates, simply because that’s what I usually have around. I also use about four times as much bulgur as she calls for, because I have a deep love of (and insatiable hunger for) carbohydrates. These two changes seem small, but they make for a big change in the dish: instead of being, essentially, a vegetable dish with an enriched sauce, my version is more about the grains, with the greens providing flavor and color. In addition to using this dish medicinally to ward off winter doldrums, I also use it throughout the year both as a light midday meal and as a flavorful side dish — it’s North African in origin, but pairs well with most any sort of robust protein, especially if it’s grilled. For a real treat, though, try it for breakfast: instead of the usual bland, sweet warm cereal, you get a hit of invigorating spices, a whole grain, and some healthy (and delicious!) green vegetables. May it carry through this last month of slushy snow-shoveling; I hope it will for me. In a medium saucepan, saute the onion in the olive oil until it is translucent. 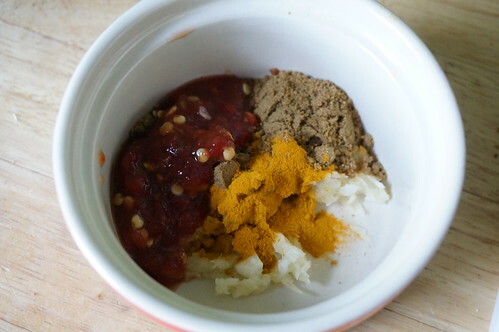 Add the garlic paste, cumin, turmeric, chili paste, and tomato paste, and saute until very fragrant, about 30 seconds. Bring to a boil, reduce heat, and simmer for about 15 minutes, until bulgur is tender. Add the defrosted spinach and the cilantro and parsley, and simmer for a couple more minutes to mingle all the flavors. Serve immediately. As written, this makes a fairly thick porridge or stew. I’ve also made this same basic recipe with a greater ratio of stock to bulgur, for a more soup-like consistency, which is lovely. I’ve called for frozen spinach above, since I’m writing in early March, when there are few fresh greens around. If you’re reading this in the growing season, though, or if you have access to other greens, I have great news! Pretty much anything green will work! Arugula, kale, tatsoi, bok choy, even lettuce mixes: I’ve used them all. Since fresh greens contribute water of their own, you may want to pre-steam to wilt them, then wring them out and chop them once they’ve cooled. 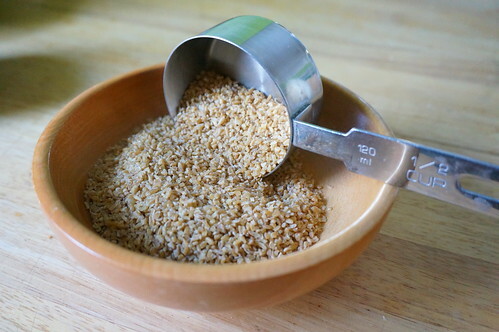 Or you can just decide to be happy with a slightly soupier finished product, as above However you do it, plan on using about 2 big bunches or 1 1/2 pounds of fresh greens for this quantity of bulgur and seasonings.